1. Meerkats often engage in group activities, including wrestling matches and foot races. 2. There are different calls that meerkats use for a variety of purposes. For instance, there is one call used for when snakes are approaching and other calls to alert others about predators that are coming near. 3. Meerkats are immune to snake and scorpion venom. This allows them to be able to feed on these creatures from time to time. 4. The meerkat belongs to the mongoose family. 5. A group of meerkats is referred to as a gang, a manor, or a mob. 6. On rainy cold days, meerkats tend to sleep a little longer before getting up in the morning. 7. A meerkat’s ears can close automatically when they are burrowing to help keep sand out of them. 8. The main predators for the meerkat include falcons, hawks, and eagles. 9. The meerkat is not endangered at this time. It is considered to be one of the animals of “least concern” of becoming endangered. 10. Meerkats are found mostly on the continent of Africa, specifically near the southern tip of the continent. 11. Including their tail, meerkats generally measure an average of 20 inches long. 12. Meerkats spend much of their time in burrows, or underground holes and tunnels, to protect them from predators and the harsh African sun. 13. The preferred diet for meerkats includes caterpillars, beetles, scorpions and spiders. They will also eat birds, fruit, plants, eggs and small reptiles. 14. While a group of meerkats goes out to look for food, several of them will stay behind to “babysit” the baby meerkats, or pups. The group rotates on this responsibility. 15. 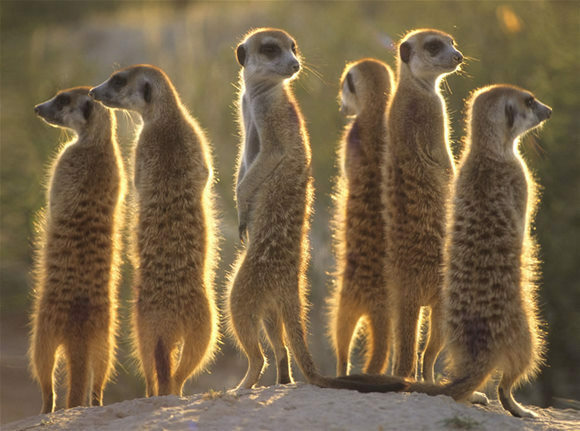 One meerkat in a group – the sentry – will find a high point in the area to keep a lookout while the rest of the group forages for food. They will stand on their hind legs and scan the surroundings for potential predators. If they see a predator approaching, they let out a loud squeal so the others can run for safety. 16. Meerkats forage for food for up to 8 hours each day. 17. When a meerkat is first born, it only weights about one ounce. 18. A meerkat’s average lifespan is about 10 years. However, only about 25% of the meerkats live to see adulthood. 19. Meerkats live in groups that can include as many as 40. Every meerkat in the group participates in foraging for food, taking care of the smaller meerkats, and keeping an eye out for predators for the safety of the community. 20. The color of meerkats can range from tan to gray to a silver-like color. They also have dark stripes on their back which helps with camouflage. 21. The stomach area on a meerkat absorbs heat and helps them stay warm. 22. The meerkat’s eyes have something like sunglasses surrounding them. This helps save their eyes from the sun’s rays by deflecting them away. They are also farsighted and cannot see very well up close. 23. Meerkats will mark members of their group with their scent in order to keep away members of rival groups. 24. Altruism is a common trait among meerkats. They will often share their burrows with squirrels, yellow mongoose, and even snakes. 25. Within six months of being born, a meerkat is fully grown.